What will be the five best new dishes at Epcot Food and Wine Festival 2016? Here's my list. 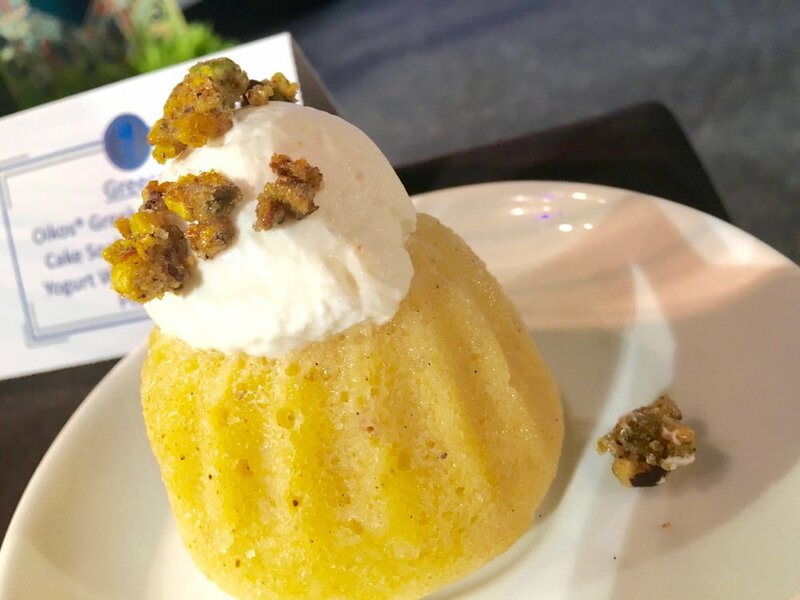 I sampled a slew of debuting entrees and desserts yesterday at a preview held for Tables in Wonderland members and the media. I was enchanted with these newcomers. Seared scallop with truffled celery root puree, Brussels sprout and wild mushrooms, from the Wine & Dine Studio marketplace: The sweet scallop will be given a Napa Valley twist, served with a creamy vegetable puree laced with that I suspect may be truffle oil, plus an al dente vegetable and lively bits of mushroom. This dish so good I'd order it in a fine-dining restaurant. Smoked beef brisket and pimento cheese on griddled garlic toast from the Hops & Barley marketplace: The beef was tender and smokey, but the addition of garlic toast and a shmear of intense pimento cheese put this dish over the top. Pork tenderloin with cannellini bean ragout and zinfandel reduction from the Wine & Dine Studio marketplace: The pork was fine, but incidental. Get this dish for the beans in the savory wine-laced sauce. Peanut butter and white chocolate mousse with a caramel drizzle at The Chew Collective marketplace: This dessert is creamy, almost frothy, with a strong peanut butter flavor plus plenty of peanut halves to chew on. Loaded Greek "nachos" with pita chips, meatless sausage crumbles and vegan tzatziki at the Greece marketplace: I was dreading tasting this once I learned it was vegan, but guess what? It was terrific. I kept eating beyond the two bites I require of myself for this type of review. Using the pita chips as nachos, I scooped up flavored, multitextured portions of a rich and satisfying entree. The sauce is made with "cashew cream." You'd never know it. As always, the Epcot Food & Wine Festival will involve weeks and weeks of food and beverage events at the Epcot theme park. Small bites and drinks like those above will be sold at themed marketplaces dotting the World Showcase. In addition, guests can sign up for culinary demonstrations, chef-prepared meals, a food-and-wine gala called Party for the Senses, Beverage Boot Camp and way more. In fact, The Chew will host events October 5-7. Full details will be posted on this link starting July 11 and you'll be able to start booking your cheese seminars, spice-mixing sessions and signature dining experiences on July 21. The Epcot Food and Wine Festival 2016 is longer than ever this year -- 62 glorious days of culinary hedonism. It will run from September 14 through November.